For the first time in Egypt & the Middle East, London Business School in cooperation with the Center for Executive Excellence (CEE) addressed “Strategic Execution” through a 2-day workshop on November 29th & 30th, 2010 at Four Seasons Hotel. Prof. Zeger Degraeve is a leading expert in decision-making, operations research and managing project portfolios - London School of Business, has delivered the workshop. This course develops the talent management strategy for organization. Identifies practical actions for how to recruit, retain and manage key talents in addition to recognizing the practical challenges for organizations that may face in the recruitment, retention and management of key talents. 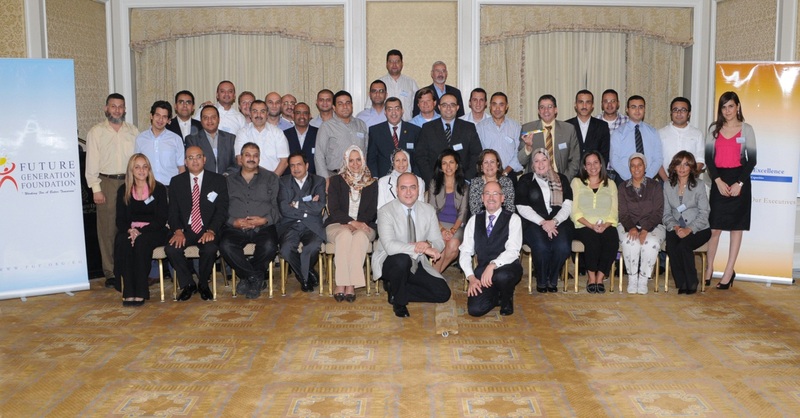 Thirty – Five (35) top executives from the private sector in Egypt attended the workshop. In the opening ceremony, the welcome note was delivered by CEE Manager Mrs. Nermeen Abou Gazia, followed by an introduction to the program by Prof. Degraeve. The graduation ceremony was held on November 30th, 2010 wherein Mr. Moataz Al Alfi handed out graduation certificates to the participants. The Foundation organized the 4th annual employment fair for Graduate Resource Program (GRP) graduates. The fair was held at the foundation premises on Saturday 16 October 2010, and witnessed the participation of more than 1000 GRP graduates. Mr. Mohamed Farouk Hafiz, the Secretary General and Board Member, inaugurated the event which witnessed the participation of 54 reputable local and multinational companies representing diversified sectors in the market such as: Banking and Financial services, Information Technology, Logistics, Food industry, Automotive, and insurance …. Participating companies offered more than 4000 vacancies during the fair. All companies expressed their satisfaction with the organization of the fair, and confirmed their appreciation for the high level of GRP graduates who are qualified to enter and compete in the labor market as a direct impact of the continuous development of the program which witnessed the introduction of new specialized tracks based on market demand. Moreover, GRP graduates articulated their appreciation for the role the foundation is playing in providing the intensive scholarship which qualified them for the labor market through the development of the English business, IT skills, soft skills, in addition to studying one of the specialized tracks at the end of the program. They have also expressed their satisfaction with the fair which availed diversified job opportunities through the participating companies. The Center for Executive Excellence (CEE) held a 2 days workshop on October 13th & 14th, 2010 in cooperation with Mr. Stephen Carver rated one of the top three lecturers best in Europe’s top business Schools -Cranfield School of Management for the first time on “Managing Change, Complexity and Crisis” within the Organization in Four Seasons Hotel. This course explores how to manage change, complexity, and crisis within organizations and addresses the suite of behaviors that managers need to acquire in order to manage projects, programs, and crisis across the spectrum of change. Thirty - Five top executives from private & public sectors in Egypt attended the workshop. In the opening ceremony, the welcome note was delivered by CEE Manager Ms. Nermeen Abou Gazia, followed by an introduction to the program by Mr. Carver. The graduation ceremony was held on October 14th, 2010, wherein the Executive Director Mr. Tamer Badrawi handed out graduation certificates to the participants. The Center for Executive Excellence (CEE) held its third Sohor Gathering on August 28, 2010, at the Four Seasons Hotel – Nile Plaza. The event was attended by a large gathering of Executive Leaders Club (ELC) committee members, CEE senior and top graduates, and human resources and training professionals. The Sohor was a great opportunity for the graduates to socialize and reminisce about past training programs organized by the CEE. One of the main purposes of the event was to introduce the ELC, its mission, vision and objectives. ELC Chairman and IGI Real Estate Managing Director Dr. Lobna Reda gave a presentation highlighting the main activities and committees of the ELC. The opening remarks were delivered by The Secretary-General and Board Member Mr. Mohamed Farouk Hafeez, who began by introducing the ELC. The ELC is the first executive club of its kind in Egypt, providing its members with continuous learning through workshops delivered by top keynote speakers from all over the world, sharing their experiences and success stories through periodic gatherings, and hosting more than 1,700 CEE graduate executives. As a step to know How to deal with conflict and negotiation; the Center for Executive Excellence (CEE) organized a breakfast event on Wednesday, March 24th, 2010 hosting key note speaker Dr. Daniel Shapiro, Founder, and Director of the Harvard Int’l Negotiation Program who delivered a special session on “New Frontiers in Negotiation” . Dr. Daniel is the associate director of the world-renowned Harvard Negotiation Project, the group that wrote the international bestseller Getting to Yes, and is coauthor of the new bestseller, Beyond Reason: Using Emotions as You Negotiate. And his course at Harvard Law School is consistently among the most highly rated. The event took place in the Four Seasons Hotel–Nile Plaza, a large gathering of Top Executives and General Managers attended this unique gathering. In addition to some of the senior graduates of the Center for Executive Excellence (CEE). The opening remarks were given by Mr. Mohamed Farouk Hafeez, the Board Member & Secretary General and Americana Group Executive Vice President for Human Resources & Management Development.